The Princess Aurora falls under the curse of the Evil Fairy Carabosse on her sixtenth birthday, falling into a deep slumber of one hundred years. Only the kiss of a prince could break the spell. 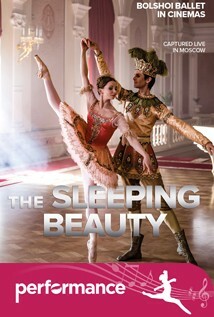 'The Sleeping Beauty' features scores of magical characters including fairies, the Little Red Riding Hood, Puss in Boots, and a beautiful young Princess Aurora performed by Olga Smirnova, a “truly extraordinary talent” (The Telegraph). This is classical ballet at its finest. The other dancers include Semyon Chudin (Prince Désiré), Alexei Loparevich (The Evil Fairy Carabosse), Yulia Stepanova (The Lilac Fairy), Vitaly Biktimirov (Catalabutte), Artemy Belyakov (Bluebird) and Anastasia Denisova (Princess Florine). Captured live on Jan. 22, 2017.